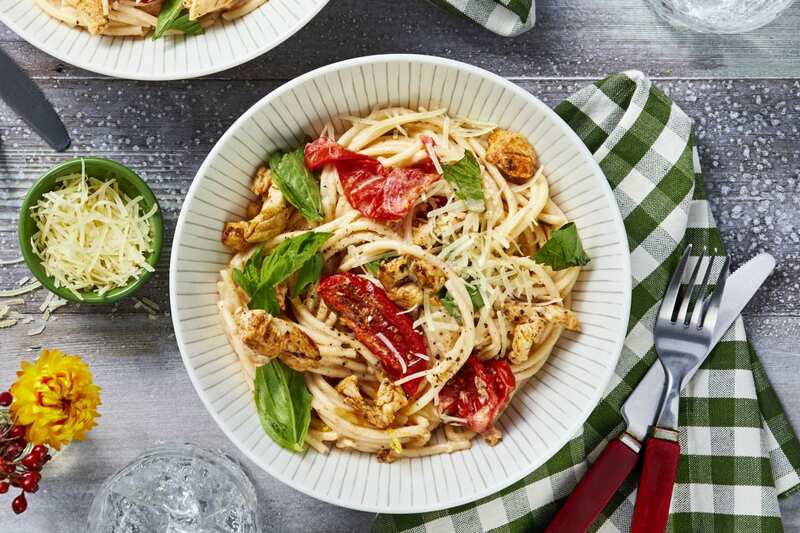 Our chefs just took pasta night to the next level: thanks to linguine, tomatoes, and chicken with Tuscan herbs, this recipe has all the Italian flair you could want and then some. The dish is accompanied by a sauce that has all the creamy goodness you want—it has cream cheese, Parmesan, and garlic herb butter for a trifecta of dairy deliciousness. So get ready: these tasty noodles are waiting to get twirled ‘round your fork. Wash and dry all produce. Bring a large pot of salted water to a boil. Adjust rack to upper position and preheat oven to 400 degrees. Zest ½ tsp zest from lemon, then cut into quarters. Squeeze 1 TBSP juice into a small bowl (save any remaining lemon for another use). 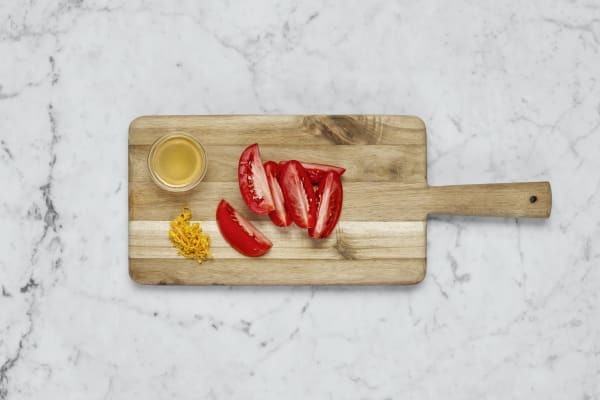 Cut tomato into ½-inch-thick wedges. 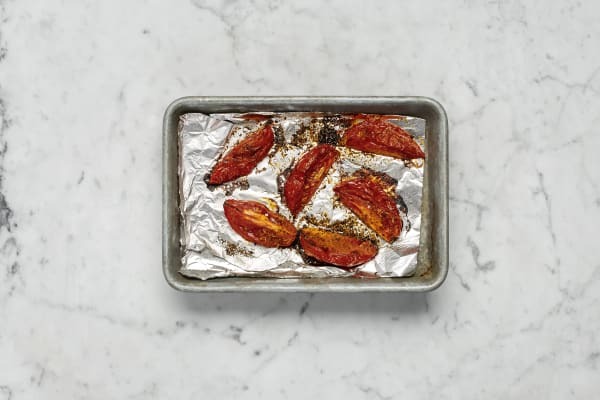 Line a baking sheet with aluminum foil, then arrange tomato wedges on it skin sides down. Drizzle with olive oil; season with salt, pepper, and 1 tsp Tuscan Heat Spice (save the rest for step 4). Roast on top rack until wilted and beginning to release their juices, about 25 minutes. 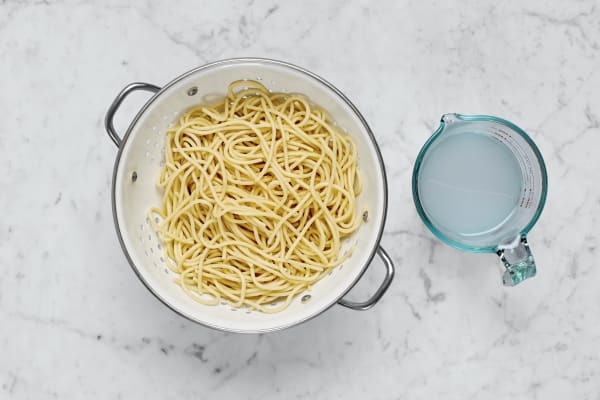 Once tomatoes have roasted 10 minutes, add spaghetti to pot of boiling water. Cook until al dente, 9-11 minutes. Reserve ½ cup pasta cooking water, then drain. 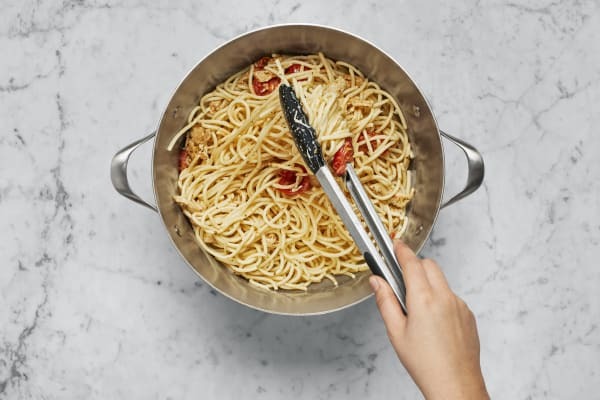 Set spaghetti aside in strainer; keep pot handy for use in step 5. Pat chicken dry with paper towels and season with salt, pepper, and enough of the remaining Tuscan Heat Spice to coat (you may have some left over). Heat a drizzle of oil in a large pan over medium-high heat. Add chicken and cook, stirring occasionally, until browned and cooked through, 3-4 minutes. Remove from heat. Add 1 TBSP plain butter to pot used for pasta and place over medium-low heat. Add lemon zest, cream cheese, and ⅓ cup pasta cooking water and whisk until smooth. Stir in spaghetti, garlic herb butter, reserved lemon juice, and half the Parmesan. (TIP: If pasta seems dry, add more cooking water, a little at a time, until coated in a loose sauce.) 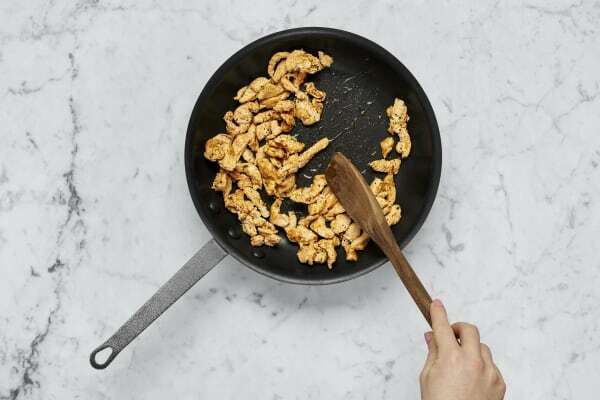 Toss in chicken, then season with salt and pepper. Pick basil leaves from stems; discard stems and roughly chop or tear leaves. 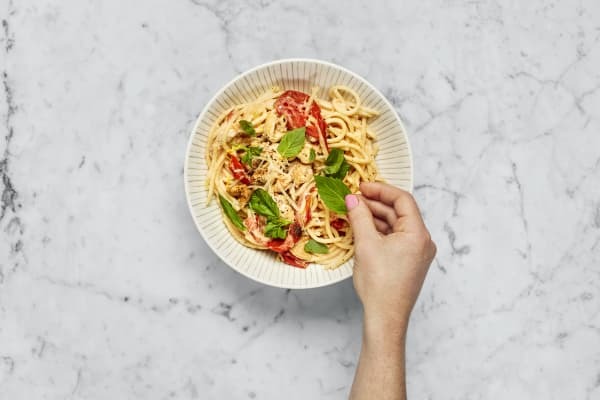 Divide pasta between bowls and top with tomato wedges. Garnish with basil and remaining Parmesan.